ChemBox is a really exciting project that we launched in 2017. The boxes contain all the equipment and chemicals needed to run 6 of our ChemBAM experiments with a class of 32 students. 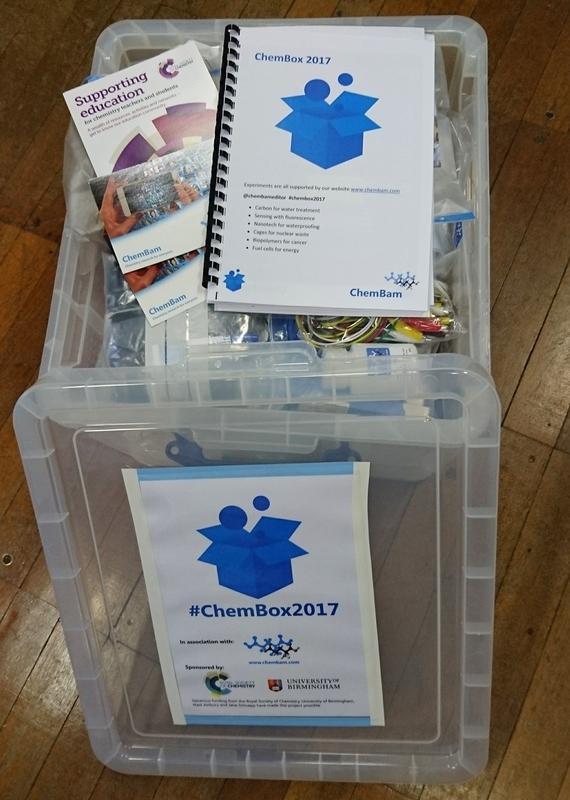 Our ChemBox2017 project involved 10 schools in the Birmingham area. Each school received one of the boxes and we ran training sessions for the science teachers. We’ve also been invited by lots of the schools to run classroom sessions from Y7 to Y12, taking researchers and undergraduates to work with the school groups. ChemBox2017 was very kindly sponsored by the Royal Society of Chemistry, the University of Birmingham and Mark Astbury. We’re really excited to be working with Phillips 66 UK for our next ChemBox project, which will deliver boxes to schools in the Humberside region.